Groundwater Sciences Corporation (GSC) engaged in a water supply development project for the City of Taneytown to help expand the production capacity of the municipal water supply system. A well site was selected east of the City in the Triassic sandstones of the New Oxford Formation and a well was drilled to a depth of more than 1,000 feet. 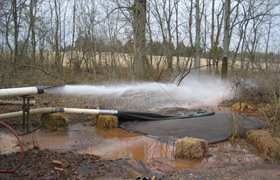 Several high-yield water-bearing zones were encountered that cumulatively produced more than 400 gallons per minute, making it one of the highest producing wells in the area. 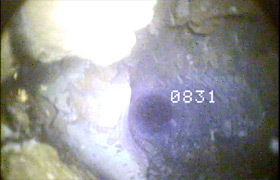 Video inspection of the well bore revealed that the high yield was produced from fractures associated with a listric fault zone. Subsequent aquifer testing was conducted and numerous surrounding domestic wells were monitored during the testing to observe drawdown and assess potential impacts from sustained pumping. Results of the analysis showed that impacts were likely to be minimal, sustainable yield was high, and water quality was excellent. The well will be used to augment the production capacity of the water system to support the growing community.